We will be performing maintenance on ALL games on Sunday, March 13th. 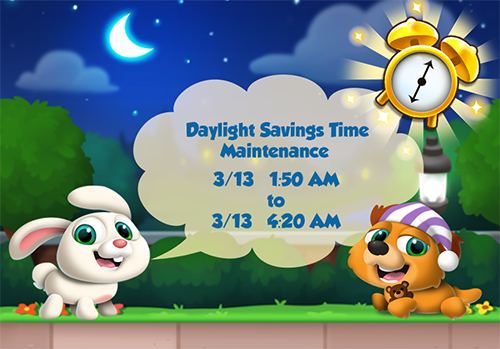 Maintenance will begin at 1:50 AM PST and is expected to last just a bit over 3 hours. Once maintenance is complete, all games will return online around 3/13 4:20 AM PDT. Last edited by [S8] Regina; 03-12-16 at 02:07 PM. Since this is an inconvience for me as I'm in Australia, and I only have less than a day to complete the cruise - does this mean we won't lose out hours? Because I have things cooking in restaurant story which are obviously for a times event and I shouldn't be missing out on time for it. You can use this Time Zone Converter to figure out your local time. You can enter "San Francisco" for the TL time zone (PST). Last edited by SpiritWind00; 03-13-16 at 04:34 AM. I hoped maintenance might have resolved the crashing problems in dragon- wishful thinking!! Try closing out your game to see if you can open the game. Please try deleting and redownloading the game. Also try closing out any applications running in the background. I'm was a level 99 player on restaurant story, but since 10/2/2016 the game was reset itself and send me back to level 1, i totally can't to login again in the Android phone, but in my iPad still can show my restaurant, may i know when will fix this problem?